The fierce battle for the playoffs in the Eastern Conference continues today as the Pittsburgh Penguins host the Tampa Bay Lightning in an afternoon matchup of the two current wildcards in the Eastern Conference. The two teams are currently tied in the standings with 66 points apiece, though the Pens have the benefit of having played one fewer game than the Lightning. It'll be the third and final meeting between the two teams this season, and the Penguins will be looking to get into the win column after falling to Tampa 5-4 in OT in January and 6-3 earlier this month. 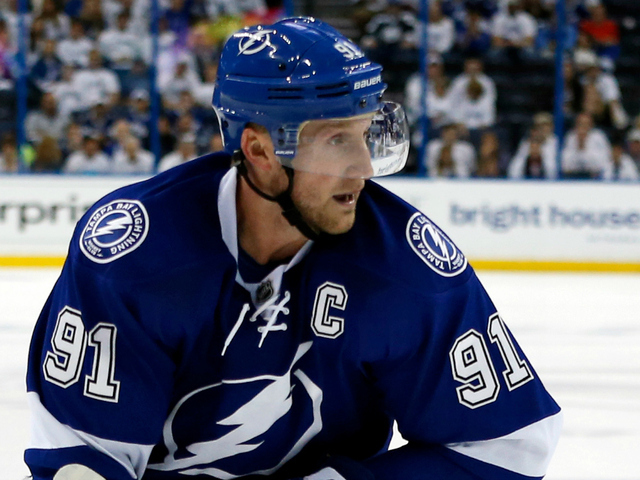 The biggest story line centering around the Lightning this season has been Steven Stamkos and his impending unrestricted free agency, but earlier this week Steve Yzerman took some of the mystery out of the situation by announcing that Stamkos would not be dealt before the February 29th trade deadline. While hamstrung by Stamkos' NTC, it would appear that Yzerman is resigned to keeping the star center to make a playoff push before losing him for nothing in the offseason. Stamkos currently is 2nd on the Lightning with 23 goals and 44 points, but those number correspond to his lowest scoring rates since his rookie season. Even with the off-year, if/when Stamkos reaches free agency he's likely to secure a deal with the highest AAV in the cap era, beating out the $10.5 million cap hit shared by Jonathan Toews and Patrick Kane. While Stamkos is faltering heading into free agency, it's another pending free agent, this time a restricted free agent, who is pacing Tampa Bay in scoring. Nikita Kucherov has 23 goals and 49 points in his 3rd season and will be looking for a handsome raise on his $700k salary this season. The 22-year-old Russian is following up a strong sophomore season in which he posted 65 points and will surely be a priority for Yzerman in the offseason. Kucherov isn't the only young player Yzerman needs to deal with. Alex Killorn is coming up on free agency with 28 points in his 4th season, while another young Russian, Vladislav Namestnikov, has produced a respectable 26 points so far in his 3rd year. Tyler Johnson and Ondrej Palat will be eligible for extensions when the new league year starts July 1st, though with both players taking a big step back from the combined 135 points they scored playing on a line with Kucherov last season it's likely Yzerman will see if either rebound next season. For a much different reason, Yzerman must also figure out what to do with Jonathan Drouin. While Drouin is still suspended indefinitely for failing to report to the Syracuse Crunch, word from the Tampa Bay locker room is that the players would welcome Drouin returning to the ice with the NHL club. - Thursday's 6-3 win against the Red Wing was Mike Sullivan's 28th game coaching the Pittsburgh Penguins, the same number as previous coach Mike Johnston had this season. The Pens went 15-10-3 under Johnston, good for 33 points. Under Sullivan? 14-9-5 for an identical 33 points in what has to be one of the most shocking stats on the season for Pittsburgh. - Mike Sullivan announced that Evgeni Malkin will miss the weekend games against Tampa Bay and Buffalo. The head coach said Malkin will need to practice with the team before he can return to the lineup.